One of Britain’s last remaining inland, open air saltwater pools. 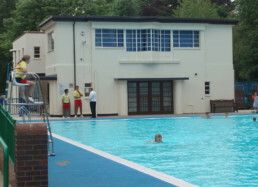 The original art deco building stands tall at the end of the pool and the lido premises are nestled in beautiful, green parkland. 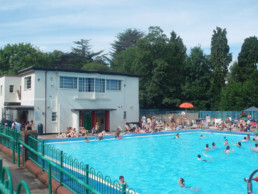 The lido closed in 2000 but in April 2005, the people of Droitwich Spa held a parish poll in which 98% voted in favour of restoring the lido. It was re-opened in 2007 and still uses the natural brine feed. Open-air saltwater swimming pools heated to 23°C: 40m pool with beach entry, children’s wet play area with water cannons and fountains, sun terraces and Lido Café. Droitwich Spa is situated on vast deposits of salt and the town’s natural brine contains 2½ lbs of salt per gallon – ten times stronger than sea water and rivalled only by the Dead Sea. When the Lido opened in 1935 it was heated to the exact temperature of the Mediterranean Sea. 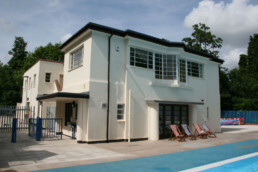 Owned by the local council (Wychavon District), operated by Wychavon Leisure who offer a great variety of activities including fun sessions, pool parties, special events. Block tickets and season tickets are available. 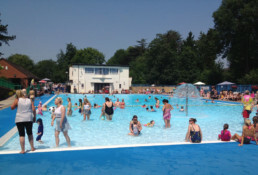 Friends of Droitwich Spa Lido actively raise funds and awareness of the pool.